It grows wild all over the shop, field edges etc but as it's a root crop you need the landowners permission to dig it up, or if you're lucky you find some on common land. I've got a nice patch of horseradish that grows as a perennial in our front garden, but for the life of me I can't remember where I got the plant. I think I may have picked it up in the herb and veggie section of our local nursery way-back-when about 8 years ago. Sorry I can't help on where to buy the root to use but I do know that the plant can become very invasive (once you have it you rarely get rid of it), so best to plant it where it won't get in the way. Like a near a hedge where it won't encroach on anyone's plot or your own. Kella I think a good place for us to grow it on the plot would be the boundary into the next farmers field...may keep some of the weeds down!! Tahtimbo...thanks for the site...I will use it if I can't find any in the stores. Tracey...to be honest it's not something I'd ever looked for but will now keep my eye open for it...good thing about being a local is I've grown up with most of the land owners so if I find some they will let me dig it up!!! I was looking for clues on your blog as to where you are located. Since you call your mom "mum" I'm going to guess UK - I found this cool website where you can get it. Sheila you were correct in guessing UK...thanks for the site..it's great...still hoping we can find some locally but now at least we know we can definitely get some!! Harder to get rid of than to grow. Don't grow it from seed. All you need is a piece of root. Pop it in the ground (doesn'e matter which way up. Next year spaghetti junction. 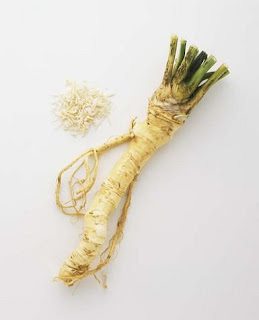 The phrase 'pernicious weed' was invented for horseradish. But it tastes wonderful freshly grated (with beef, betroot, mashed potato etc. 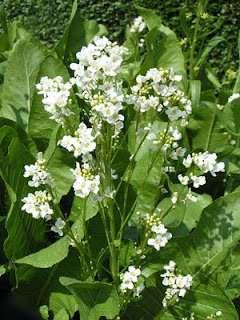 Try Victoriana Nurseries for Horseradish, tell the boss (stephen) i sent you, or click the ad on my blog! If you want to buy some, most Asian type shops sell it in root form, and I'm fairly sure I've seen it in Sainsbury's. thanks for that we checked all our local supermarkets and had no joy...my friend has found an out of the way greengrocer in town that said he will get us some root so we have finally had success but I would like to thank everyone for there info on the subject...it was much appreciated!!! Hi Tanya, I have never visited your blog before and I have to say it's a very nice chatty blog and you are working hard by the looks of things. I just wanted to say I overheard a conversation in our local garden centre and a lady was telling someone that she was over-run with horseradish and regrets planting it, so be careful. Could you perhaps plant it in a container ? I have been looking to buy some just to use in a recipe, but none of the supermarkets sell it, but I really don't wont to plant any. Good luck with all you grow next year. yeah I have heard about how the horseradish grows Maureen but i have found the perfect place to put it so that it can't spread into un-wanted areas...thanks for visiting!! I've got some on my blog (but you'll have to turn a blind eye to the weeds). In fact I'd post you some plantlings if you emailed me an address to send them to. I'm sure it would travel because you can't kill this stuff, but you may feel differently once you see how vigorous it can be.